Moscow-based trio turned quartet Pompeya has been around for quite a few years now, bringing their very personal blend of pop-infused indie rock to an ever growing mass of loyal fans. Ever since the band’s formation back in 2007, Daniil Brod, Denis Agafonov, Nairi Simonyan and newest addition Sasha Lipsky cultivated their differences and developed a sound that distinguishes them from most other Russian pop/rock band. Their debut album Tropical proves once again that they are not your average rock band. On the album, Pompeya bring out the big guns: lush arrangements, New Wave-tinted vocals and catchy guitar riffs are all part of the mix. The influence of 80s music is obvious in Pompeya’s music but they never try to imitate, instead they take the best of this period and build upon it, pushing the music forward straight into the future of pop. 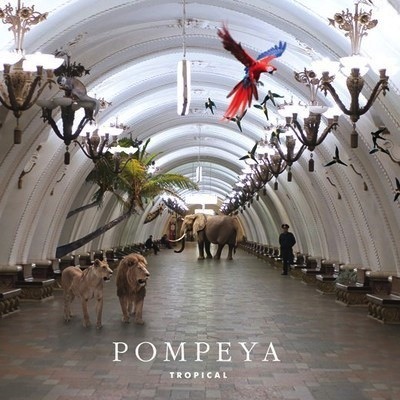 Not unlike Friendly Fires or Is Tropical, Pompeya pumps some new energy into old formulae and they create something that sounds fresh and interesting. Need proof? You can stream the whole album on Bandcamp. As a bonus, here is Pompeya’s 2009 single “Cheenese”, an exquisite piece of melodramatic pop which was the track that managed to put the band on the map for many music critics or bloggers.